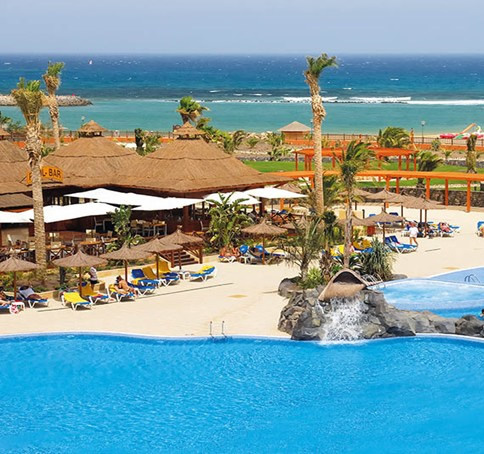 The 4 star Hotel Elba Carlota Fuerteventura is a relatively new hotel, the hotel opened in 2007 just outside the popular resort of Caleta de Fuste the Elba Carlota has an enviable beachfront location and is opposite the island's original 18 hole golf course. For those who enjoy walking by the sea, there is a magnificent promenade with wonderful views right next to the hotel. 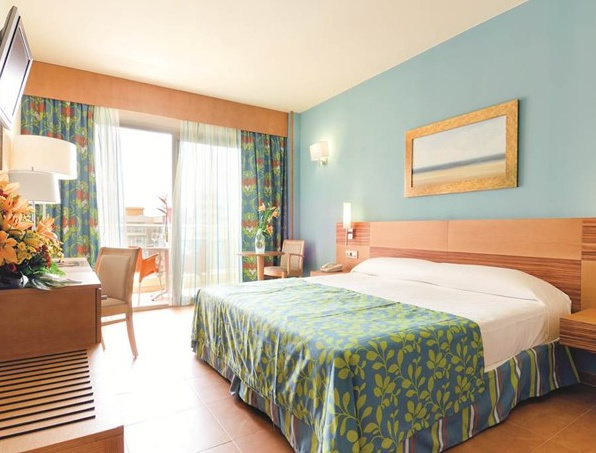 The Elba Carlota is situated a mere 10 to 15 minute taxi ride from Fuerteventura airport. This hotel has something for everyone and would suit golfers, couples and families and with the conference facilities at the hotel great for conferences and meetings. The Elba Carlota has 323 luxury double rooms, 23 Suites and Junior Suites. All of them benefit from air conditioning, mini bar, direct dial telephone, satellite TV, safe and a complete bathroom with separate bath and shower, hairdryer and magnifying mirror. 180 rooms are designated family rooms, also available are interconnecting rooms for larger families, there are also rooms with king size beds, rooms for the disabled and rooms for non-smokers all on request. 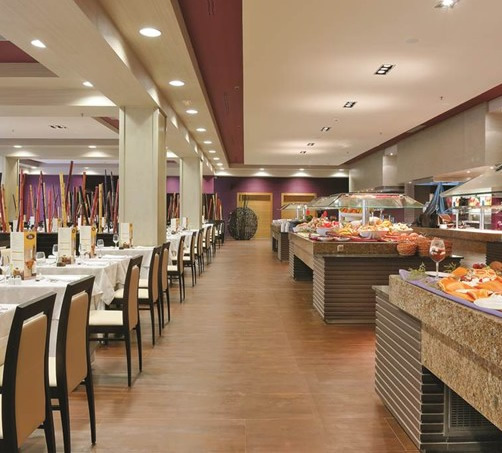 The hotel provides a choice of board arrangements from bed and breakfast through to all inclusive, the main restaurant Tindaya has buffet service and show cooking, a great feature here is the large terrace that enables guests to enjoy their meals outdoors. During the day snacks can be taken at the El Arrecife restaurant by the swimming pool. In addition to the pool bar the hotel has the lobby bar Sinatra, a cocktail bar and a lounge bar where live shows are provided several times a week. The hotel has several attractive features including 2 swimming pools (1 heated), a children's pool, fitness room with sauna and Jacuzzi, a tennis/multi-sport court and an 18 hole mini golf. 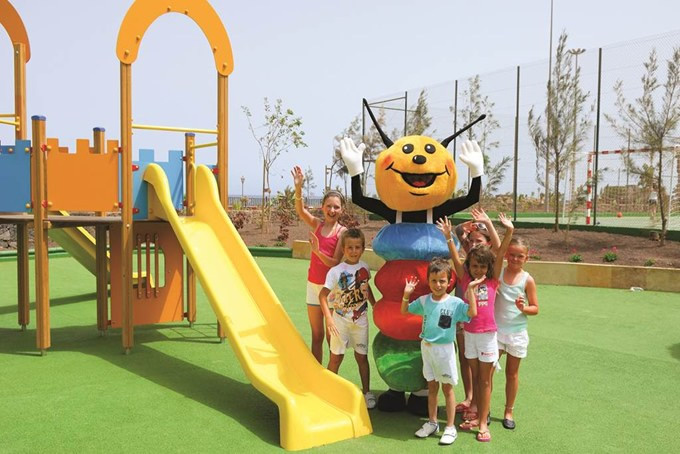 There is a mini club and a children's club and the hotel provides a day time and evening entertainment programme for guests. 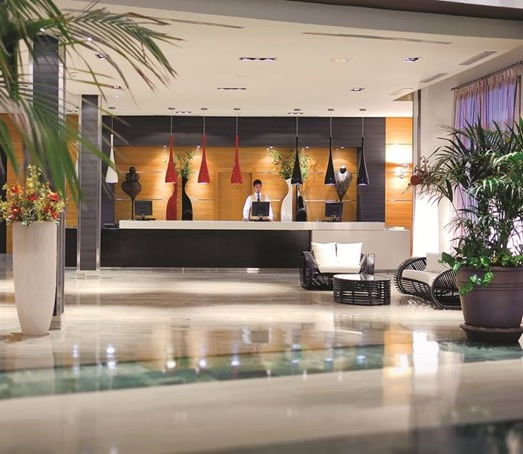 The Elba Carlota Hotel has a business Centre, ample parking, customer Service Desk, 24-hour service, money exchange, excursions and rent a car. Also a golf desk, 5 meeting rooms with capacity up to 800 people (3 of them with natural sunlight), newsagent with press and souvenirs, full program of activities for kids and adults a teenagers Club: pool table, video games, water sports: Aerobic, Aqua Gym, beach volleyball, a hard court and shooting range and a diving School. Situated close to the hotel is a shopping centre with several shops, supermarket and cinema.